Nine Mile Creek is now a thriving ecosystem and part of a green corridor connecting Onondaga Lake to upland areas as a result of Honeywell’s improvement work. Thirty acres of enhanced wildlife habitat are now home to 30 fish and wildlife species. Nine Mile Creek will be accessible to the public in fall 2015. Left: Work at Nine Mile Creek was completed in mid-October; this section, near Geddes Brook, was realigned and graded to create floodplains and wetlands. Right: A great blue heron in Nine Mile Creek. About 41,000 native plants, trees, and shrubs are now supporting a thriving ecosystem. Left: Nine Mile Creek before remediation. Right: Nine Mile Creek after restoration. Left: Nine Mile Creek during construction. Right: Nine Mile Creek after restoration. Several fish and wildlife species have already returned to Nine Mile Creek and nearby areas, including the common bluetail damselfly (left) and green heron (right). The wetlands and creek were enhanced with trees, including oak, maple, and sycamore; shrubs, including hazelnut, chokecherry, and spicebush; and plants, including ferns, sedges, and bulrushes. Nine Mile Creek is now home to 30 fish and wildlife species, including beaver, muskrat, white-tailed deer, bald eagle, mallard, northern pike, largemouth bass, sunfish, red-tailed hawk, and green frog. Left: During construction, crews remove material from both banks. Right: Workers plant red maples and oak trees, both native to the local forest wetland ecosystem. Capping work in Onondaga Lake continues. While the work is in progress, the lower portion of Nine Mile Creek will be used for construction activities. Additional plantings will be completed in 2015. 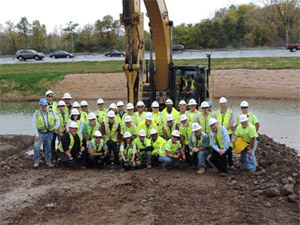 Members of the Nine Mile Creek construction team. Nine Mile Creek is one of the primary tributaries of Onondaga Lake, flowing north and east from Camillus and entering Onondaga Lake as it passes under the Onondaga County West Shore Trail extension. On the shores of Onondaga Lake and along the lake’s tributaries, Honeywell is improving a total of 50 acres of wetlands and planting about 1.1 million plants, shrubs, and trees.